In light of the 20-year anniversary of the prestigious Art Collection Deutsche Börse, Foam presents Changing Views – 20 Years of Art Collection Deutsche Börse, an extensive range of works from one of the most important corporate collections of contemporary photography. The Art Collection Deutsche Börse comprises approximately 1,800 works from over 120 international photographers, including iconic names such as Diane Arbus, Walker Evans, Bernd & Hilla Becher, Rineke Dijkstra, Dana Lixenberg, younger photographers like Tobias Zielony and Mike Brodie, and hidden gems like Gerd Danigel or Gabriele and Helmut Nothhelfer. The exhibition period consists of four back-to-back presentations that record positions on some key themes of the collection, with works from different photographers. This concept celebrates the variety and comprehensive quality of the Art Collection Deutsche Börse. The four successive chapters are: Germany (3 – 19 May), Icons (21 May – 9 June), Traces of Disorder (11 – 23 June), and Youth Culture (25 June – 7 July). The Deutsche Börse started its renowned Art Collection in 1999. The Collection is dedicated to the central themes of contemporary photography from the mid-20th century onward, with subjects ranging from landscapes and portraits to still lifes, interiors and street photography. Since 2015, the non-profit Deutsche Börse Photography Foundation has been responsible for the development, presentation and preservation of the Art Collection Deutsche Börse. The Foundation’s intended purpose is to develop and show the collection as well as to promote projects and institutions on the subject of photography. Most notably, it focuses on discovering and supporting new talent as well as on developing educational platforms and encouraging scientific dialogue. The works in Changing Views are mostly situated at the premises of the Deutsche Börse Group. Deutsche Börse is a global stock exchange organisation and provider of infrastructures for financial services. The photographs can be found in their office locations worldwide; London, Luxemburg, Prague, Paris and Singapore, mainly in the corridors, in the canteen and in the indoor museum space of the headquarters in Eschborn near Frankfurt, Germany. In light of the 20-year anniversary, the iconic works are now exchanging their familiar surroundings for the museum rooms of Foam. The exhibition opens with chapter Germany. Amongst others, the collection recognises the work of German photographers and to the depiction of Germany. This varies from the famous names of the so-called “Düsseldorfer Becher-Schule” to hidden gems from former East Germany. Thomas Ruff, Thomas Struth, Candida Höfer and Jörg Sasse are all among the first students to be taught by Bernd Becher at the Staatliche Kunstakademie in Düsseldorf. The artist couple Bernd and Hilla Becher became known from photographs in which they captured water towers, mine shafts and factories in the industrial landscape of Germany as neutrally as possible, always from the same point of view, always with the same light. The work of their students varies widely, but what they have in common is their investigative, objective, concentrated way of working. Their images often have a strong autonomous quality enhanced by the large format. In this chapter, you will find hidden gems such as Gerd Danigel, Gabriele and Helmut Nothhelfer and Helga Paris. 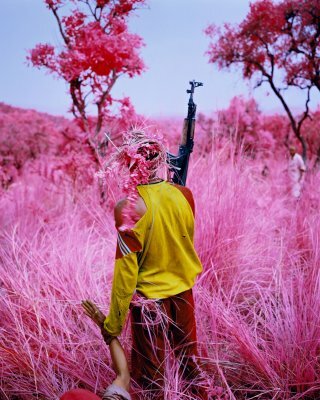 People and how they relate to their environment is an important feature in the Art Collection Deutsche Börse. The second chapter Icons displays the work of some of the most iconic names in photography’s history. Icons from different times and with different cultural backgrounds, that with their bodies of work, have helped generate the images of we in our societies. For example, the photographs of Diane Arbus, Philip-Lorca diCorcia, Rineke Dijkstra, Walker Evans, David Goldblatt, Dana Lixenberg, Nicholas Nixon and Martin Parr function like a mirror in which we can recognise ourselves. For the following chapter, Traces of Disorder, a selection has been made from photographs that show traces of political conflicts and disturbed or changing social orders. It shows work by classic photojournalists such as Philip Jones Griffiths and Anja Niedringhaus, as well as photographers who make groundbreaking work in critical documentaries, such as Simon Norfolk and Julian Röder. Richard Mosses’ impressive works draw attention to the most pressing political conflicts in an aesthetically unusual way, such as using military film material. The fourth and last chapter, Youth Culture presents a selection of works by photographers who are attentive to the lives and attitudes of the youthful. 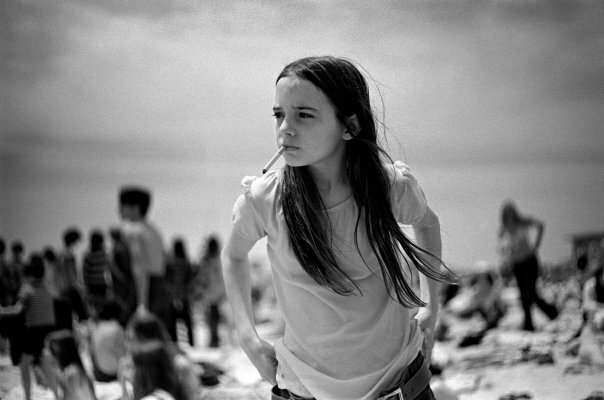 The portraits of Joseph Szabo from the seventies and eighties sometimes reveal the sadness that teenagers can carry, but also the unbridled zest for life. One of the most influential series of Susan Meiselas is The Prince Street Girls in which she portrays a group of adolescent girls on their way to adulthood. Mike Brodie photographed his friends searching for freedom and an alternative way of life by train-hopping. The photos of Tobias Zielony show young people in the public space. 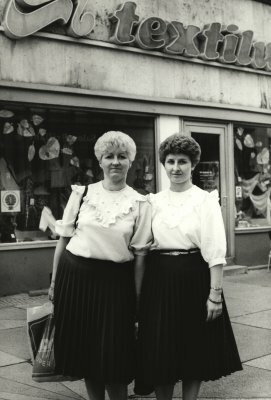 Whether the photos were taken in Wales, Marseille or Los Angeles, the subject remains the same; hanging around on the street and on chosen ‘stages’ such as parking lots or gas stations. A key characteristic of the Art collection Deutsche Börse is that the collecting itself is carried out in depth. This means that several works are purchased from each photographer. In addition, follow-up purchases are regularly made, continually acknowledging and respecting the oeuvres of the photographers. Anne-Marie Beckmann, Director of the Deutsche Börse Photography Foundation, has been responsible for curating the Art Collecting from the beginning. Changing Views – 20 Years of Art Collection Deutsche Börse is curated by Foam and the Deutsche Börse Photography Foundation. Foam. Open daily 10am - 6pm, Thurs/Fri 10am - 9pm. For information and visual material, and/or for general enquiries about Foam, including Print Sales (Foam Editions), Bookshop and Collection, please check www.foam.org/press or contact the Press Office of Foam on +31 (0)20 5516500 / pressoffice@foam.org. Foam is supported by the BankGiro Loterij, De Brauw Blackstone Westbroek, City of Amsterdam, Foam Members, Olympus and the VandenEnde Foundation.